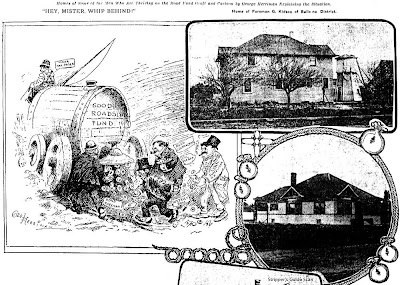 Today we have Herriman's contributions to the February 18, 21, and 24th editions of the Examiner. The last three are from Sunday the 24th. 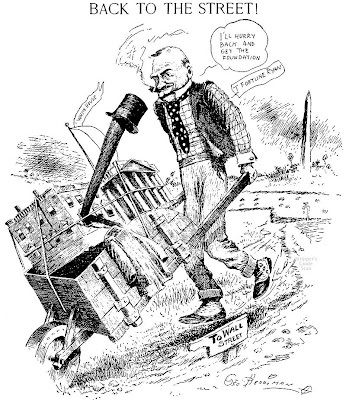 We have a little road graft crisis going on, and Herriman makes an uncharacteristic editorial cartoon about national news with his commentary on T. Fortune Ryan, a notorious Wall Street wizard who Herriman apparently thought was getting too chummy with Washington. 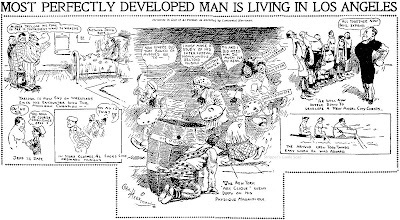 On the 24th we get a pair of full page-width cartoons, one a cute item for the auto section masthead and a second, for sports, about Al Treloar, the worl'ds most perfectly developed man, who has just moved to LA. Read more about Treloar here, or watch a video of the man in action. Fair warning! 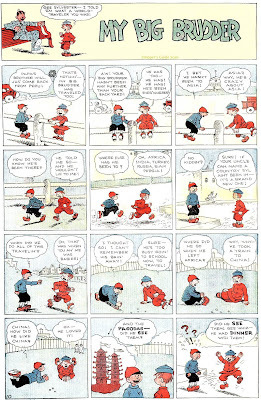 If you read the three strips above you will feel like you've utterly wasted 30 seconds of your life. 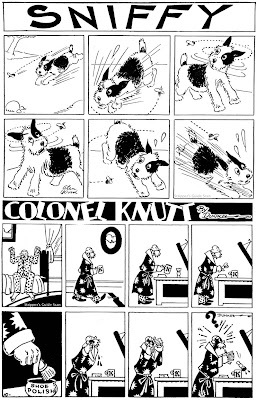 Sniffy we've seen already, it's by Glen Wood, and Colonel Knutt is another Courtney Dunkel strip. Both prove that good art does not save bad writing, even in pantomime. Cookie Pushers is by Buford Tune. 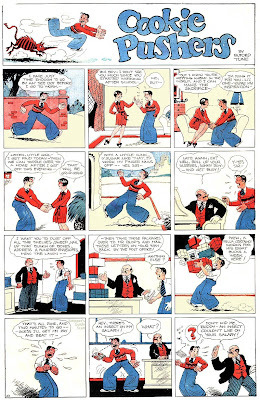 Tune was concurrently in the middle of a three year stint as the final cartoonist on Doings of the Duffs, and would later gain a measure of lasting success as the creator of Dotty Dripple, a strip that ran for 30 years. In this awful strip the 'gag' is actually self-contained in the final two panels, all the preamble signifying nothing. And the gag is such a clunker I bet even Pink Laffin would have rejected it. The slang term "cookie pusher" at the time referred to a lazy person who curried favor by giving compliments (typically undeserved). Later on it morphed into a more specific term used as a pejorative for junior diplomats. Awful strips and an etymology lesson -- it's a bad day to visit the Stripper's Guide blog. I wouldn't say "utterly wasted". I always enjoy these posts, one way or another. Thanks Lyn, my cockles are warm and toasty! My Big Brudder is a Just Kids/Reg'lar Fellers knockoff, unsigned but most likely an Art Helfant production. Frosty Aire is by Joe Archibald, who had a vigorous, only semi-professional style. While his art wasn't going to win any awards, he was a pretty good writer. The gag here is surprisingly subtle considering the venue. Archibald kicked around with the smaller syndicates, mainly in the twenties. At the moment I happen to be trying to make sense of his panel cartoon Why Boys Leave Home. It was advertised only in the 1926 E&P listings as being from the Wheeler-Nicholson syndicate and credited to 'Davidson'. 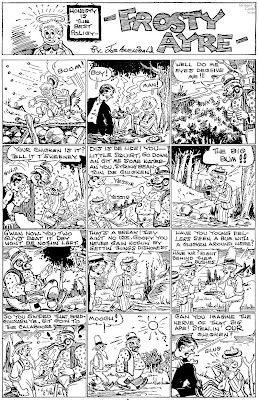 Yet the only examples of the strip I can find are from 1930, syndicated by McClure, and credited to Joe Archibald. Huh??? Just wondering if you have seen any examples or reprints of Baldy Benton's work of the late 1940's, "Jasper Jooks." I've been searching the web without too much success. Sure have seen Jasper Jooks, and it's a real pip, too. There are no reprints that I'm aware of. 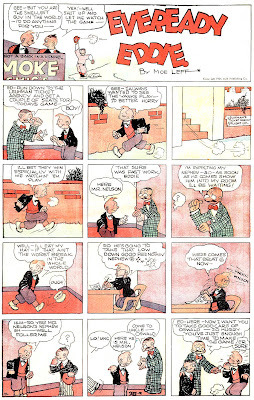 Here we have a much more typical episode of Percy and Ferdie, complete with MacGill's trademark overlong word balloons. I notice that the cartoonist couldn't seem to make up his mind whether he was a "Mc" or a "Mac". 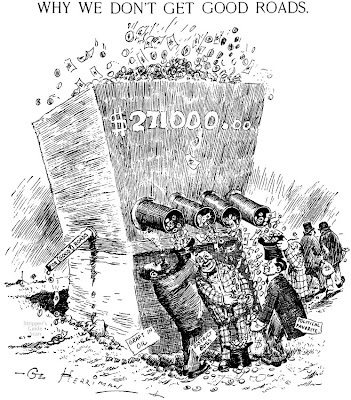 We also have a pretty good Copper Penny gag by Ted O'Loughlin. Ted took over Finney of the Force from F.O. Alexander shortly after his stint with Dell. 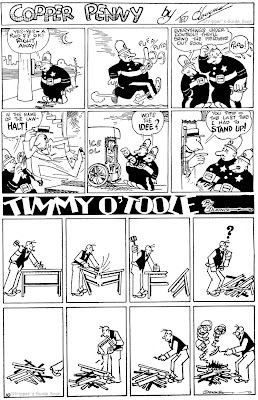 Timmy O'Toole is by Courtney Dunkel who did quite a few features for The Funnies. Why he has Timmy trying to drive a nail into the middle of a table is anyone's guess. What a great style that Ted O'Loughlin has! I couldn't find anything about him on the interweb - do you know more? I don't have any biographical info about him in my files. His only other newspaper credit after Finney was a three year stint on the Sunday "Sport Stars" that ran in the Philadelphia Bulletin's Fun Book. the online who's who of american comic books has him doing comic books in c1945-1947, working for Columbia and Street & Smith. I have a SPARKY WATTS comic he signed. 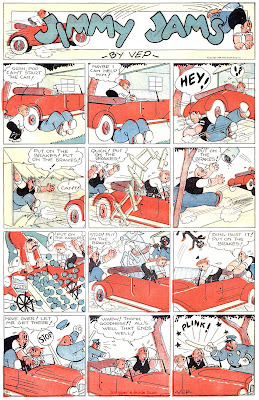 It also mentions a 1930 strip: Krazy Klippings. Ted O'Loughlin worked at the Philadelphia Evening Bullentin newspaper during the mid-sixties. He was the cartoonist for a column titled, "A Woman's Touch" by Joan Greisiger that was printed once a week on the editorial page from 1964 to 1966. I am putting together a book of my mother's column's and wanted additional information on Ted. Ted O'Laughlin was also the sports cartoonist on the short-lived PHILADELPHIA ILLUSTRATED SUN in 1927-8. 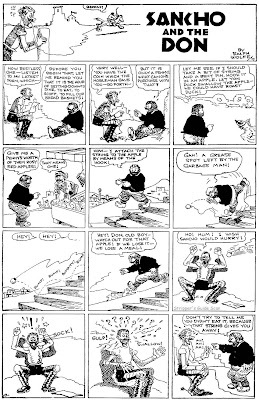 Now that I have Cole Johnson's early copy of The Funnies (#10) in hand it reveals a few problems in Beerbohm's Overstreet listing for the title, at least in my several year old edition, #36. Perhaps the problems have already been cleared up in later editions. the section was originally 24 pages, not 16 -- sometime between Cole's copy and mine the size dropped, probably when the price dropped from 10 cents to 5 cents. the publication was not always a weekly; Cole's is dated September 1929, the indicia states monthly publication and a blurb says the next issue will be available on October 15. Assuming monthly frequency for the first ten issues, that puts #1 published December 1928, not in 1929, which is borne out in the indicia which states "entered as second class matter December 27 1928". Also, for those interested in such details, this issue had some credits; Harry Steeger was the editor and Abril Lamarque was comic art editor. 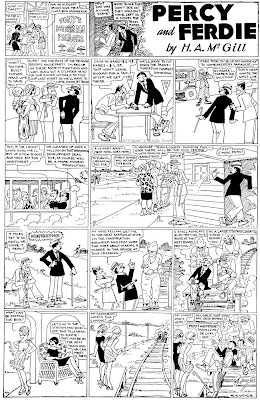 For today's strips, we have another of Ralph Wolfe's Sancho and the Don, plus a newcomer, Eveready Eddie by Moe Leff. Mo, as he would later sign himself, supplied the art for a couple of Joes (Jinks and Palooka) and as a ghost on who knows how many other features. 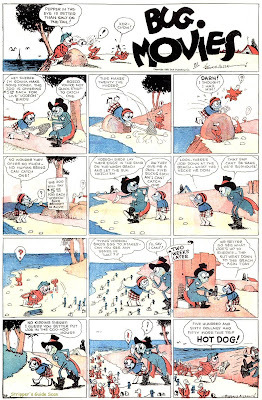 Here are two of the color full tab pages from Cole Johnson's The Funnies #10. Jimmy Jams we've talked about. Bug Movies was by Stookie Allen, a fellow who seems to have had a fan following despite never having a really successful feature (much like Boody Rogers, another Funnies alum). He specialized in factual and inspirational features for over 30 years, so Bug Movies is an unusual departure for him. Judging by the truly awful gag above (hey Stookie, dumb characters can be funny -- brain damaged drooling morons not so much) he was smart to stick with factual features.